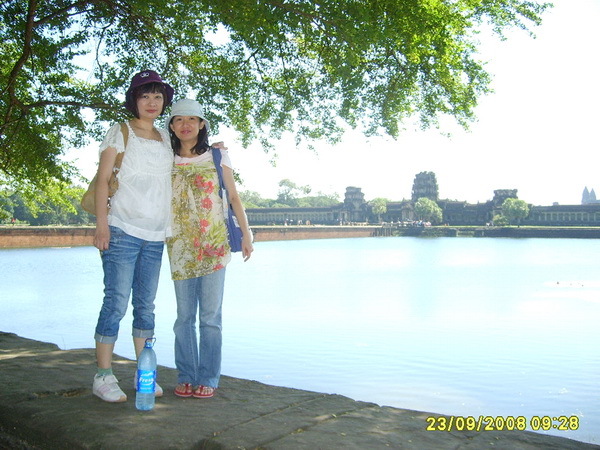 "Angkor Wat (or "Temple City") is one of the Seven Wonders of the World. It was built between 1113 A.D. and 1150 A.D. by the Hindu king, Suryavarman II and is one of the largest religious monuments ever constructed. Originally built as a Hindu temple dedicated to the god Vishnu, it was converted into a Buddhist temple in the 14th century, etc, etc". Who could forget those oft-mundane history classes from junior high which always seemed to last longer than they humanely should? Oi Len and I had just returned from our Swiss holiday two months earlier and already I was in need of another vacation. 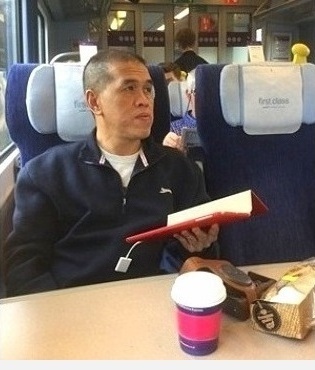 Not that one was justified or deserved in any way - it's just the incurable wanderluster in me. Enter AirAsia who were offering five-ringgit seats one-way from Kuala Lumpur to Siem Reap, Cambodia. That's US$1.25, mind you! My jaw dropped. It didn't matter that this was an oft (but unfairly) criticised airline; I wasn't about to let my sentiments blur my common sense. A steal's a steal however you look at it. Even with peripheral costs inflating those digits 20-fold for each leg of the trip, the offer was still a good one. The opportunity to see Angkor Wat in the flesh - or rather in the stone - had just presented itself and I duly took up the offer. Angkor Wat; it'll be like history class all over again - only more fun. Our tour of Angkor Wat took place on our second day in Siem Reap, the nearest international gateway located just 20 minutes or so from Angkor. The weather - bar the 33°C heat - was ideal for a day of exploratory sightseeing. 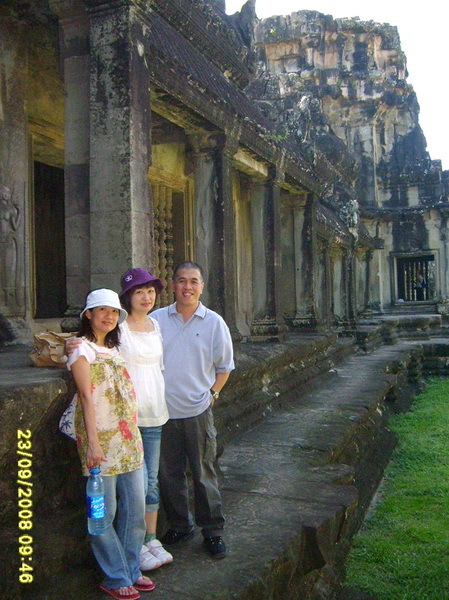 We arrived at Angkor at mid-morning. What struck us most on arrival were the scores of roadside hawkers at the car park selling everything from pickled mangoes to fizzy drinks to disposable cameras. And then of course there are those poor kids - each wearing that look which never fails to arouse some degree of pity for them - who'd run up to you and ask, "One dollar... will you buuuuy...? ", each peddling bottles of mineral water, local handicrafts and sunhats. Steadfastly decline and you'll be fine. Buy, and you'll be swarmed in a flash by the other twenty or so kids in the vicinity. Everything here sells for US$1; be it a large or a regular Pepsi, a bangle or three, a can of beer or a snapshot with one of the kids. One dollar. Oi Len and her sis at the visitors' car park. That's Angkor Wat's main entrance in the background. Angkor Wat is so integral to Cambodia's sense of self that its image forms part of the national flag - the only building in the world to be so honoured. The black and white outline of the temple's towers against a red/blue background matches the view that greets you as you approach from the west side of the complex as most visitors do. To access the main temple complex, visitors must first cross a moat by way of a 617-foot sandstone causeway which leads to the west portico which in itself was quite a sight to behold with plenty of lovely centuries-old bas-relief carvings. But this was just the beginning, our guide told us; what lies within will definitely take our breath away, he insists. Our history lesson starts here. 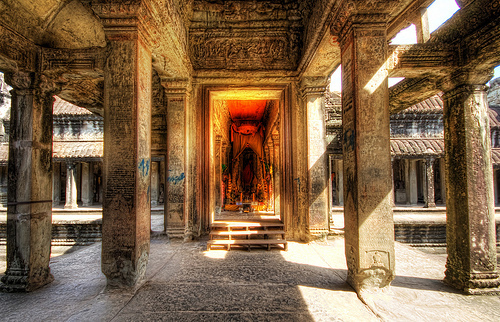 The magnificent Hindu temples of Angkor Wat are the prime attractions on the shortlist of Cambodian tourist hotspots. Situated in north-western Cambodia, about two hundred kilometres from the border with Thailand, the temples are part of the ancient city of Angkor. The temples of Angkor Wat within this city - comprising a huge complex sprawling over an area of about 81 hectares (or 200 acres) - bear testament to the architectural achievements of the powerful Khmer empire. 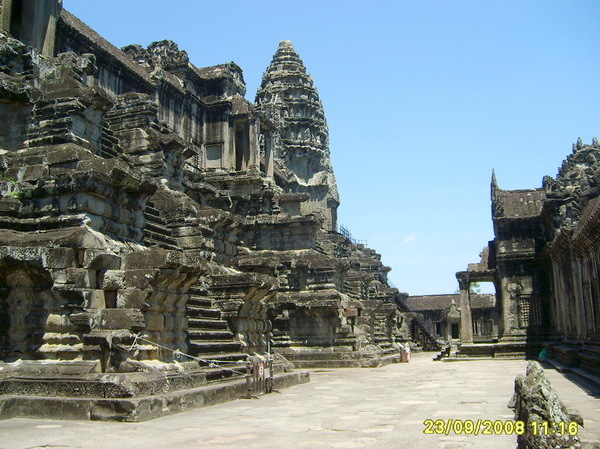 The main features of the complex are the five dominating towers of Angkor Wat. Angkor Wat and the temples which make up the entire complex are probably one of the most splendid examples of ancient Hindu architecture - not just in Cambodia, not just in Asia, but in the whole world. The bas-reliefs along the outer gallery walls of the temples depict scenes from Hindu mythology and is the longest continuous example of such work in the world. 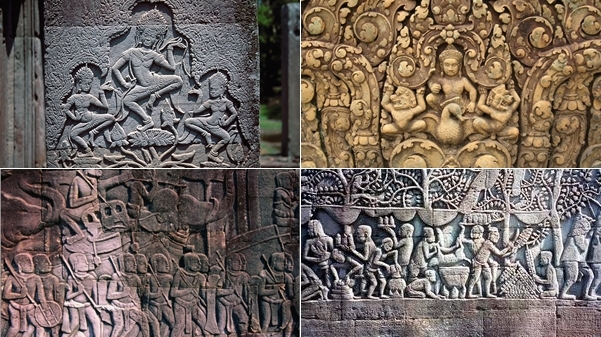 The bas-reliefs of Angkor Wat are justifiably famous. They tell tales of ancient Sanskrit epics; most notably the Mahabharata (the philosophical and devotional story of a dynastic struggle for power) and the beloved Ramayana (the epic poems depicting events in the life of Rama, a prince in Hindu mythology best remembered for his dedication to fulfilling his dharma, or spiritual obligations). But these works of art are not only on the walls. Almost every surface is carved - from the lathe-turned pillars and columns to the heavenly apsara (female spirit of the clouds and waters) dancers gracing walls, ceilings and pillars everywhere. 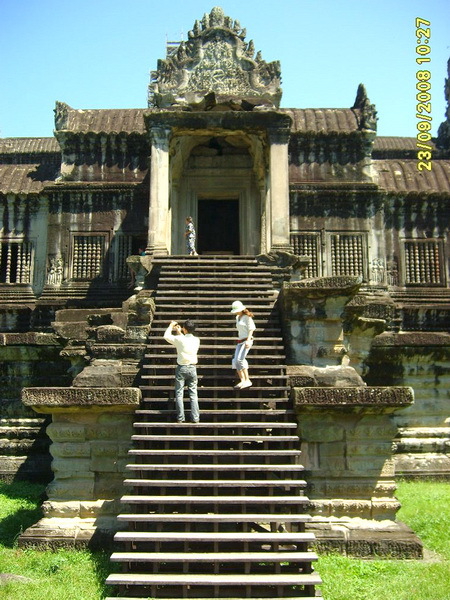 Angkor Wat was at one time the gem of the Ancient Khmer Empire but with the fall of the empire, the temple too fell into a state of disrepair and came to light only centuries later when an intrepid Frenchman stumbled upon them. Today they are on the UNESCO’s list of World Heritage Sites, a national treasure for Cambodia and a definite crowd-puller. The temples of Angkor (not to be confused with "Angkor Wat" which refers to the largest temple in this complex of 100 temples) were built over a period of about 30 years, i.e. between 879 A.D. and 1191 A.D. 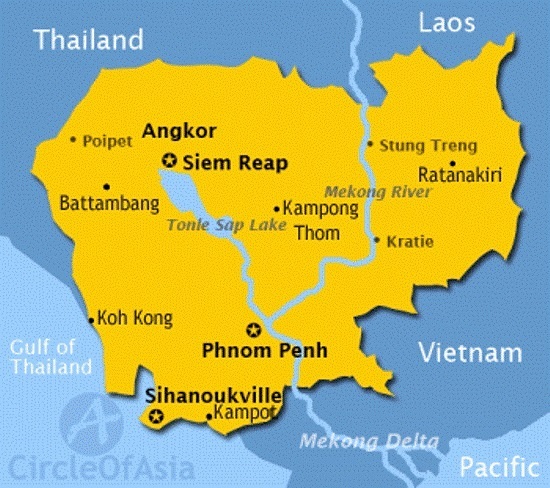 This was the period that saw the glorious ancient Khmer Empire reach the zenith of power. At its peak, the empire stretched from southern Vietnam to Yunnan province in southern China to the Bay of Bengal in the west. The epicentre of the empire was the city of Angkor; and it was from the neighbouring citadel of Angkor Thom that the Khmer kings ruled. The Khmer rulers were staunch Hindus and it was they who built the huge complex of Angkor Wat in reverence to the Hindu gods and also as a symbol of their own divine right. Following an invasion by the armies of neighbouring Siam in 1431, the city was deserted by the Khmers - marking the beginning of a period of desolation which was to last for centuries. Angkor Wat was lost to the world and seen only by itinerant Buddhist monks who embroidered their stories of the mysterious lost temples with fables of gods who had built the shrines. The temples remained isolated for years and although early European travellers reported having seen signs of it, their tales were often passed off as tall tales. 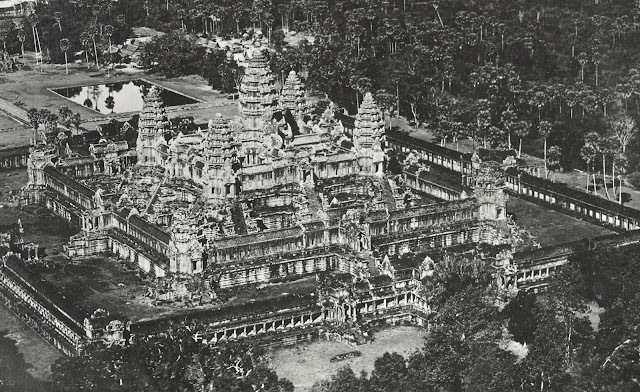 That is until French explorer Henri Mouhot brought Angkor to the world’s attention in 1860. The French spearheaded a restoration project in 1908 - a project which lasted into the 1980's. The Archaelogical Survey of India carried out restoration work from 1986 until 1992 when it attained World Heritage Site status. After that, UNESCO and the German Apsara Conservation Project have provided the funding for further restoration which is being carried out to this day. The entire city of Angkor (within which Angkor Wat is built) extends fifteen miles from east to west and eight miles north to south. In other words, it's huge (which makes me wonder how it got lost in the first place!). Around the temples, the terrain is landscaped by an intricate system of reservoirs, canals, and moats that were used for water control and irrigation. The whole system symbolises the Hindu concept of a central mountain - Mount Meru, a dwelling place for the Gods. Angkor Wat's five central towers represent the peaks of the holy mountain. The enormous moat surrounding the shrine suggests the oceans at the edge of the world. 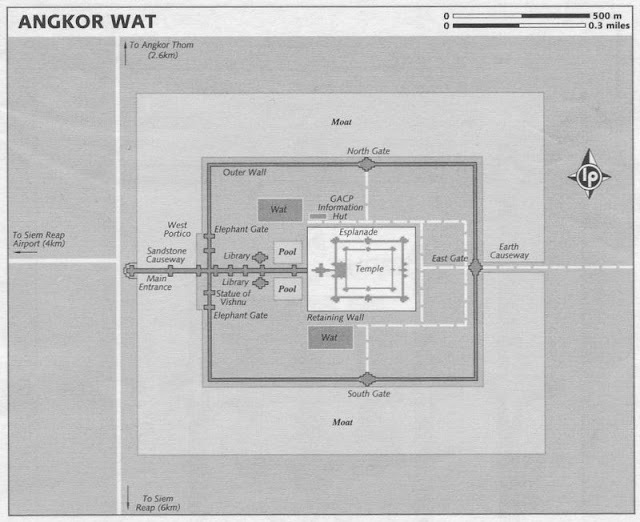 So it's pretty obvious that when King Suryavarman II commissioned Angkor Wat's construction, its design was very much based on Hindu religious influences. They don't build them like that anymore, do they? 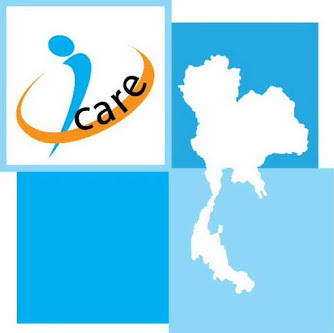 There can be no symbol more iconic of Cambodia’s attempts to guard its glorious Khmer past or that of its hope for a self-determined future. The world’s largest religious monument, Angkor Wat has always been religiously inclusive: first with respect to the original Khmer deities, and later Hinduism and Buddhism. Today, Hindu as well as Buddhist devotees alike come here to pay their respects or pray at Angkor Wat's altars to their respective gods. The stories told on the walls of Angkor Wat still live in the hearts and minds of the people, as well as in the modern practice of Khmer classical dance. Given the tragedies of recent Cambodian history, I sincerely hope the cultural heritage embodied in this iconic temple can help the Cambodian people bridge the gaps between their cultural past and their potential future. 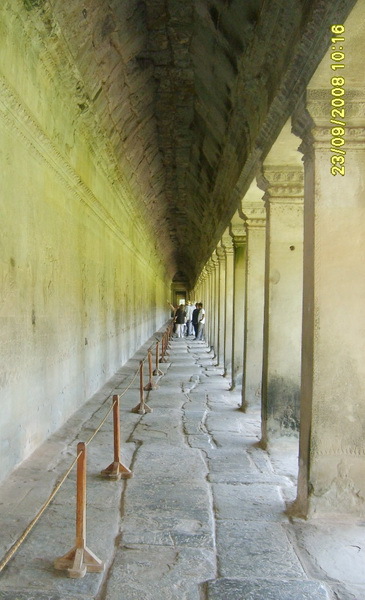 And judging by how much Angkor Wat is revered by the locals, I have utmost faith in this regard. 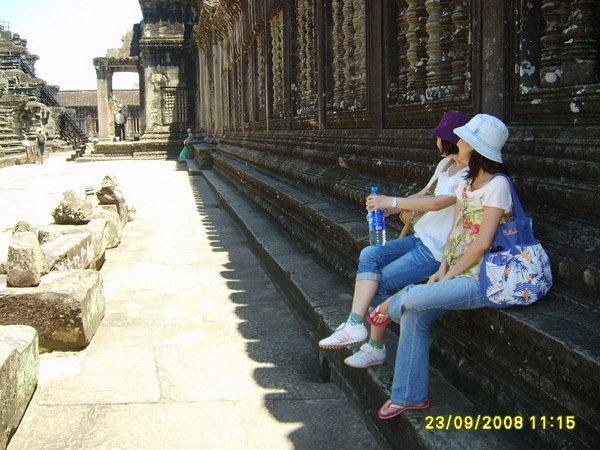 We were totally awed by the artistry and history of Angkor Wat. The beauty and magnitude of the architecture stopped us in our tracks and, at one point, even compelled me to privately get down on my knees in humble reverence. What amazed us most about standing inside these temples was the sheer quality of craftsmanship that they embodied. 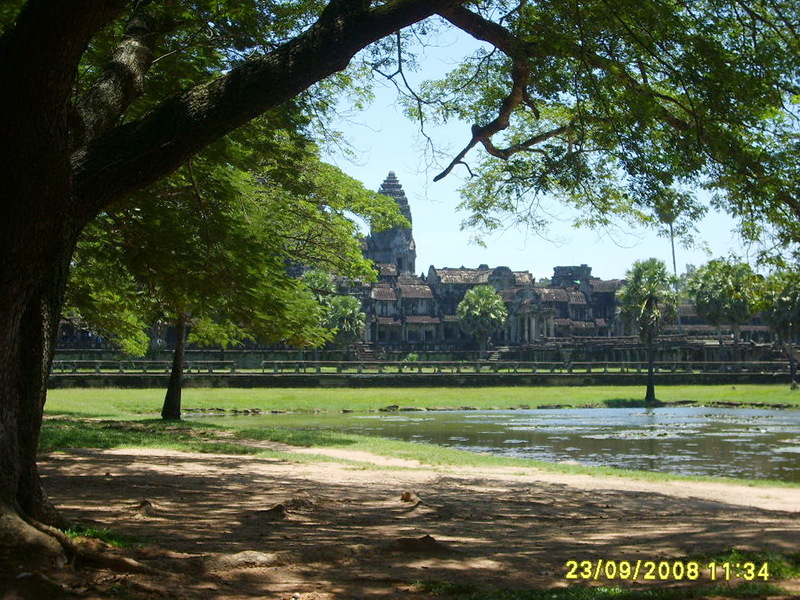 Angkor Wat is more than a mere temple. It is more than an icon on a national flag. It is a living, breathing monument. 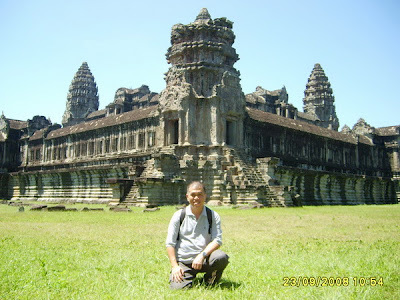 ** I dedicate this blog post to my Geordie friends, John and Karin, who indeed encouraged Oi Len and I to visit Angkor Wat; and what a suggestion it turned out to be. i love your history class!! 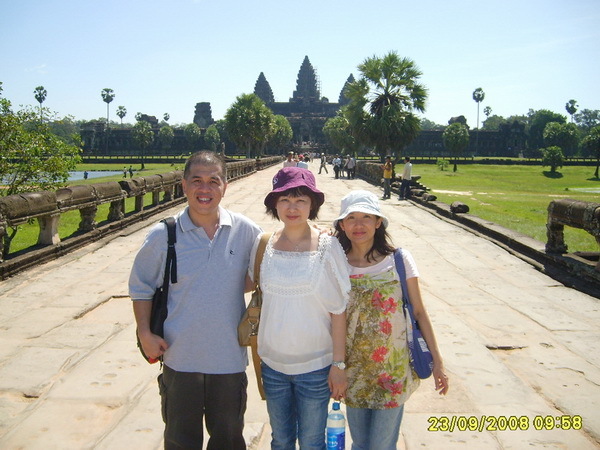 i feel like going to cambodia again! Thank you, Sylvia. I'd like to return one day too. Love the food there also. Nice history and good information you have provide. 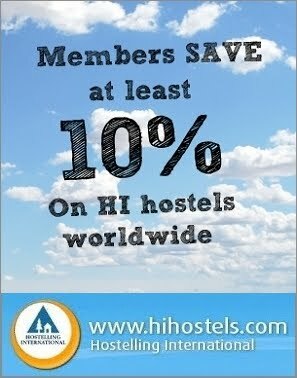 If you want to visit this country you must need good accommodation like this http://www.propertyfactsheet.com/properties/the-peak-cambodia/ I hope in near future you will provide.